Free sample of Purina One Adult cat food sample. 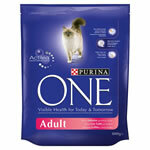 Purina One Adult is designed for cats aged 1 year or older. Along with registering for the free cat food sample you will receive newsletters, competitions and promotions.